The Reports page of the Bondora interface offers a host of customizable data so users can manage their investments. The “Repayments” report allows investors to monitor how well borrowers are fulfilling their obligations. 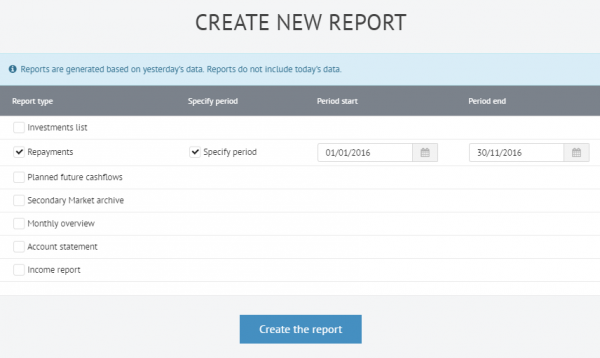 The only input required to generate a report is a start and end date. Users can then download a CSV file to their desktop. Each investment (“note_id”) is listed individually, along with the loan_id that the investment is part of. With this data users can view detailed information on principal repayments, interest repayments and the repayment of late fees. When an investor chooses a loan or a general investing strategy (conservative, moderate or aggressive) with Bondora they are choosing a risk level. For this reason the repayments report is an important tool for determining how well an investor’s portfolio is performing relative to a particular risk profile. Since all the loans with their loan_id‘s are also available from the Public Reports “Loan dataset” file, it is possible to view the total repayments from a specific loan. Users can choose not to enter a specified period. This will generate a report covering the entirety of their investment period with Bondora. 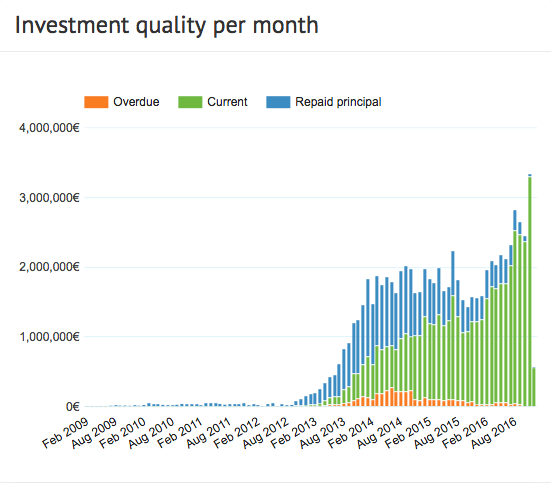 The information in this report is granular level version of the total investment quality across our platform. Over the last several years we have seen a decline in the number of overdue loans. This trend has been simultaneous with a growing level of current loans. A graphical representation of this trend can be found on General Statistics page.